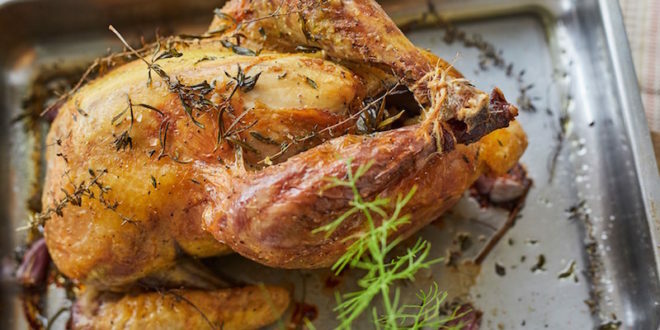 A simple roast chicken is just about my all-time favourite dish. With just a little love and effort it can also be a true revelation. The first step is to find a free-range chicken. I know they are much more expensive than most of the white, flabby chickens you find in local supermarkets but there is a good reason for that. Free-range birds have unrestricted access to pasture during the day where they can forage and they are reared for longer, and the combination of the outdoor life and a balanced maize fed diet all help to ensure succulence and flavour, and a firmer texture. If you fill the cavity with lemon wedges, loads of crushed garlic cloves, fresh thyme and lots of seasoning you will add a wonderful flavour and aroma to the finished dish. I also rub the flesh all over with olive oil and season heavily with sea salt before roasting the chicken in a hot oven (220 ºc/gas 7) for 10 minutes and then lowering the temperature to around 190ºc/gas 5 and cooking for 30-40 minutes, with the occasional basting. Pierce the thighs with a trussing needle or fork to test if the chicken is done and watching to see if the liquid that escapes is clear, then let the chicken rest for 8-10 minutes before carving. Chicken is great to cook with because its mild flavour doesn’t compete with other ingredients and buying a whole chicken is often much cheaper than buying individual cuts. One of the more popular ways to buy chicken, but also the most expensive, is to buy a breast. Chicken breasts are ideal sizes for a single portion, are easy to use and there’s no wastage, but two breast pieces can sometimes cost as much as a small whole bird. The meat on a breast is very lean and is at its best when cooked in a sauce or gently poached as in my Goan Chicken Curry. Chicken breast tends to dry out if it’s roasted or grilled without fat, so the legs or drumsticks, although dark and slightly fatty, are a better option for the barbeque as well as casseroles and stews. Because chicken breasts can sometimes be very bland, marinating them for a couple of hours before cooking can transform them into something special. Try anything from garlic, parsley and olive oil to ginger, lime and coriander. If you are fed up with chicken dinners, or fancy a change for your Sunday roast, why not give guinea fowl a try. Known as “pintada” in Spain and sometimes called an African pheasant, guinea fowl is similar to chicken, but has a mild game flavour. For those who are looking for healthy alternatives it is leaner than chicken and rich in essential fatty acids. Guinea fowl is unusual in that it is neither totally wild nor truly domesticated and has been reared for the table in since Elizabethan times. You can substitute guinea fowl for just about any chicken recipe. Stuff the chopped herbs under the skin of the guinea fowl and season with flor de sal. Heat the olive oil in an ovenproof frying pan and fry the breasts for 2-3 minutes on each side. Transfer the pan to the oven and cook for a further 6-8 minutes.